It was football but perhaps not as we know it. The game started and it was scrappy but without the puppy power Scooby's nephew brought to the table. If it was Persiram's intention to play pantomime villain then they played their role to the maximum, going to ground way too easily; it was embarrassing watching these big, hulky men throw themselves to the floor, roll around a bit then gingerly get back on their feet and carry on playing. Professional footballers, my arse. Fair play? Not a bit of it. They may have had some grievances about poor decisions from the ref but any moral ground had been lost when the game was still in its infancy. Frustrations were building in their camp, both on the pitch and the touchlines and it was obviously in the first half things would kick off. First half and there was a tussle on the far side of the field. Two players going for the ball, the fans there didn't like the way the Persiram player was getting stuck in, like I said the benefit of the doubt had gone from their earlier actions, and over came the plastic water bottles. The police and security officials responded quickly and piled on to the terrace while kids had it away on their toes. On the touchline, the visitors' bench had lost any semblance of control and security officials piled in, were pushed away and piled in again. Honestly, it was more fun off the pitch than on it. Two late goals by Patrice Nzekou secured the points for the home team, and fulfilled one tweep's prophecy, though the third came from a free kick incorrectly given by the linesman on the far side. from his lips and he was away, chased by the unhappy Persiram players while security tried to keep the warring parties apart. Meanwhile things were kicking off further down the sideline with Persiram officials making their frustrations clear. Odd but their players rolling around and going to ground had been long forgotten, they felt aggrieved and more pushing and shoving ensued. The fans were hurling plastic water bottles and abuse while at least drink in a cardboard package was lobbed from the pitch...it exploded just in front of me, and that only riled the home support even more. Meanwhile, behind the goal the Persiba fans set off some flares and carried on singing and dancing to celebrate their win. As the smoke made its way slowly across the pitch I decided to head back to the hotel. It was all very surreal and all very Indonesian! Some more images can be seen on Asian Football Pictures. Following their mid week mauling of Kuwait SC in the AFC Cup, Persipura were held 1-1 by fellow title challengers Mitra Kukar at the Mandala Stadium in Jayapura. It was the hosts who took the lead just on the half hour but the prolific Liberian striker Weeks levelled just minutes later. No one can accuse Persebaya fans of being glory hunters. This win put them three points clear of unbeaten Persipura with just a couple of games left and still the fans stay away, consistent in their insistence Persebaya ain't Persebaya but an imposter from another island. Ok so the Warriors end their season defeating the champions and they sit second...for the time being. Next we get this nonsense where the top 6 and the bottom 6 split and play each other to keep the pools company happy and because they do it in other countries. Serious question, how much motivation is there once a top 6 place has been secured and it doesn't matter who finishes 1st, 2nd etc? 3 bulan tdk di gaji...bonus belum di bayar...5 bln terahir tdk ada 1 pun perwakilan dr management yg datang ke lapangan melihat latihan tim. Roughly translated, that says ...no salaries have been paid for three months, bonus has not been paid...for the last five months, no representative from the club management has come to see the team training. You can be sure if the team had been winning, the batik wearing, kretek puffing management types would have been more than keen to have their photograph taken with the players but that ain't happening. Persita haven't won a game since early May, pauses to do some mental arithmetic, when they completed the double over Persijap, losing five of their seven games. Credible draws away to Arema and at home to Sriwijaya seem to count for nothing. It's not as if it has been an easy season for Persita off the pitch. For the second successive season they have been forced to play their home games far from their home base of Tangerang. In 2013 they were forced to play at Kuningan, West Java while the current campaign sees them in Karawang, still West Java but still a trek. As if that was not bad enough, their home game against Persija was moved to Bantul while their crucial game at home to Persib has been switched to Bandung. They sit 10th in the group and have two remaining games, one in hand on 9th placed Persik, with Pelita Bandung Raya, themselves with play off ambitions, due to visit Karawang on the last day of the season. UPDATE - Fabio subsequently tweeted he would be stepping down with immediate effect. This East Java derby had been moved from Kediri to Malang for security reasons (it was played at Gajayana Stadium), but it was western group leaders Arema who got the first shock when Bertrand gave the home team the lead. Arema, with just two defeats all season, fought back and entered injury time looking forward to three more points before Faris' late equaliser. The result was academic for Arema; they had long since secured top spot. But it was a vital point for Persik as they struggle to escape the drop zone. But was it enough? As I type this, Persijap are hosting Gresik and a point for the team from East Java should ensure their safety. Persik's final game comes at home to Gresik while Persita can look forward to a 'home' game against Persib, to be played in Bandung, before hosting Pelita Bandung Raya on the final day of the season at Karawang. The home team came from behind to crush the Cheetahs in this mid table clash. So there. Ties to be played 16 & 30 September. The last few seasons haven't been much fun for fans of PSIS. They have sat almost anonymously in Divisi Utama, bereft of cash and ambition. 2014 offered a glimmer of hope but despite a whole heap of local derbies, unlike teams in other groups, PSIS could have travelled by bus to every away game and still been back home before the sate guy had shut up and gone home. Just check out their crowds this season when they finished second in their group. Those seven home games saw an average crowd of 12,235, above the average in the Indonesia Super League. Mind you, those numbers were quite substantially down on the 2013 when they attracted an average 20,027 (the first three games were from the play offs after PSIS finished 3rd in their group). UPDATE - I understand that in 2014 PSIS have been selling match tickets with a bar code meaning anyone without a ticket cannot enter the stadium. Persewon went in to the final round of Group 8 Divisi Utama fixtures in second place and seemingly on course for a play off spot. But then, inexplicably, they no showed for their final game of the season. They were three points clear of 3rd place Persigubin and possessed a better goal difference...they would only have to turn up and they would have gone through to the play offs. But they couldn't even do that. Instead, they stayed home and Persigubin get awarded the game 3-0. And the play off spot. I wonder what the players and fans think of that! SINGAPORE — “Affordable” and “comfortable” are the key words coming from the Football Association of Singapore (FAS) as it ponders ticket prices for the ASEAN Football Federation (AFF) Suzuki Cup, which Singapore will co-host at the new National Stadium in November. Following public perception of high ticket prices (S$45-S$180) for the Juventus vs Singapore Selection game at the same venue, the FAS insists it is working hard to get the pricing just right for the eight-team tournament, which runs from Nov 22 to Dec 4. That was a sentiment echoed by AFF secretary-general Azzuddin Ahmad, who agrees that reasonable ticket prices will fill the stadium. Zainudin Nordin, president of the FAS, is on the same page. “Affordable ticket prices and packed stadiums. That’s the way to go,” he said. Akbar Hashim, who has been organising sports tours for Singapore fans for the past 25 years, thinks the Suzuki Cup is the ideal platform for bringing back the Kallang Roar. However, the 52-year-old warned: “Get the ticket prices right, don’t scare away the fans by putting too high a price. For me, the ideal price would be S$12 for the seats behind the goals; S$15 for the gallery and S$20 for the grandstand. At that level, I am confident there would be a healthy turnout. If Singapore keeps winning, the FAS is in for a bonanza. COMMENT - the problem with the use of words such as affordable and comfortable is who do they apply to. Arsenal no doubt think their tickets are affordable because they sell out every game but it doesn't take into account sacrifices people make in other areas to follow their favourite team. The prices quoted by Akbar seem reasonable to me which probably means the FAS will go in at a much higher peg. Mind you, he then blots hos copybook with the final sentence! Today's Indonesia Super League clash between Persik and Arema has been switched to the Gajayana Stadium in Malang after police in Kediri refused to issue security clearance for the game to go ahead there. There has been a history of trouble between the two sets of supporters and with Arema top of the western group it was feared large numbers would have made the relatively short journey which could have created problems. Despite being the home team, Persik can rely on a large Arema support at the stadium to do their best to put them off. It is thought some of their fans will make the trip but with the Gajayana most definitely in Arema turf any travelling supporters will struggle to make themselves heard. Arema are already assured of a place in the ISL play offs while Persik are struggling to avoid the drop. 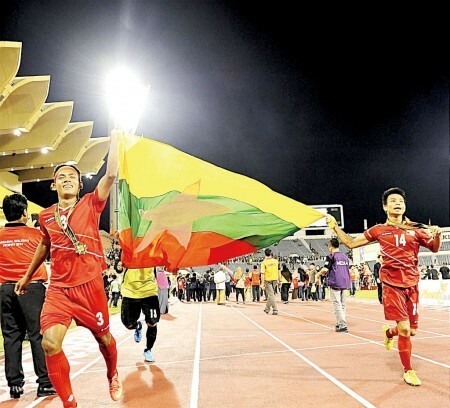 BANDAR SERI BEGAWAN (24 August 2014) – An emphatic 4-3 win over Vietnam gave Myanmar the Hassanal Bolkiah Trophy (HBT) 2014 crown in the final that was played at the Hassanal Bolkiah National Stadium in Berakas. “We deserved the 4-3 win as we had more ball possession and we created many chances in the game but Vietnam were dangerous every time we made a mistake but we were one goal better,” said Myanmar coach Zerd Geise. “We came here to prepare for the Asian Football Confederation (AFC) tournament in October but whenever we are on the pitch we always want to win. Myo Ko Tun scored the first of his two goals in the 16th minute when he capitalised on a mistake from Vietnam goalkeeper Lee Van Truong. Vietnam equalised in the 38th minute when an ummarked Phan Van Long had all the time in the world to blast the ball in from the edge of the penalty box. Myanmar goalkeeper Myo Min Latt was beaten again just three minutes after the restart off a brilliant Ho Tuan Tai solo effort as Vietnam out their noses in front for the first time in the game. But two goals from Ko Tun (58th minute) and then Maung Maung Soe (60th) regained the lead for Myanmar as Vietnam then regrouped for Player of the Tournament Nguyen Chong Phuong to slot home to put the score on 3-3. As Vietnam were all eager for the equaliser, it was Aung Thu who emerged as the hero for Myanmar when he fired in the winner from 30 metres out. COMMENT - Indonesia sent their Under 19s and they lost three games, an unusual concurrence for them, drew one and defeated Singapore 6-0. They lost 3-1 to Brunei, 3-1 to Vietnam and 2-1 to Cambodia while drawing with Malaysia. No doubt everyone will now be called for coach Indra to be sacked! We are now at the latest play off stage in Division One with 12 teams battling to go through to the next round. 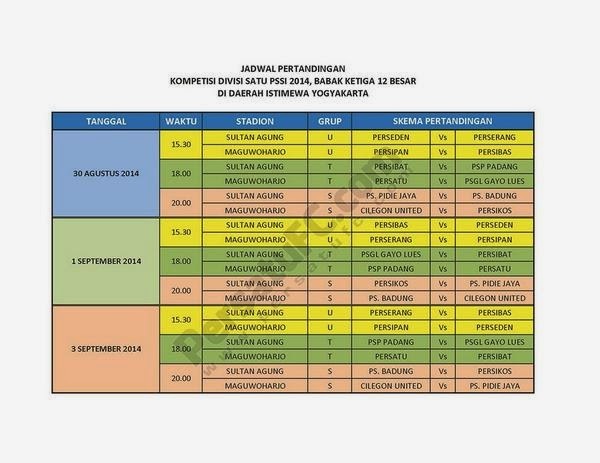 The games will be played on 30/08, 01/09 and 03/09 in Yogyakarta. Image comes from wherever it says on the watermark! Former Blackburn Rovers coach Steve Kean saw his DPMM charges romp to an 8-1 victory over Woodlands Wellington last night in Brunei but he wasn't surprised. 'The boys (have) looked fresh and sharp (in training over the last dew days). If not for the fantastic goalkeeping, it could have been double figures,' Kean said after the match as quoted on the SLeague site. Goals from Roberto Alviz, Adi Said (2), Roy O'Donovan (2), Azwan Rahman, Boris Raspudic and the prolific Rodrigo Antonio Tosi did the damage while Soon Ho Moon's goal on 58 minutes may have earned him a small bonus in his wage packet. Tosi and O'Donovan have 33 goals between them with the Brazilian the joint top scorer in the league on 19. The win does wonders for DPMM's goal difference of course, 55-21, and puts them four points clear of champions Tampines but leaves the Rams in 10th place on 19 points. It is the third time this season the hapless Woodlands have been on the wrong side of a caning...earlier in the season I saw them cave in at Albirex Niigata, losing 7-1 while they also lost at home to Home United 6-1 last month in the League Cup. It is fortunate for them the development teams, Young Lions and Harimau Muda, are in an even worse situation; in their last eight games, they have won just once, at home to Warriors, and lost six. We could say the hard work had been done in the 1st leg when Persipura had come away with two away goals. As it happened, they weren't needed as the Black Pearls mullared the holders at their own Mandala Stadium with Robertinho, who hit a hat trick, at the heart of their performance. Kuwait SC are no mugs. They have won the AFC Cup on three occasions (2009, 2012, 2013) and were runners up in 2011 yet Persipura pushed them aside though to be fair you can't help but feel disappointed with the visitors and wonder if they had done their homework on their hosts. Once Kuwait had pulled a goal back there was surely an opportunity to get at the Black Pearls. By that I mean get in their faces, rile them, go for the jugular. A second goal would have had Persipura living a bit on their nerves, knowing a third goal would have given the Kuwaitis the lead on away goals. Credit to the Indonesian champions though. They steamed down the other end of the field and restored parity almost immediately and it was the Kuwaitis who were getting riled. 6-1 on the day, an impressive 8-4 on aggregate and Persipura go through to the semis where they face more opponents from the middle east. Another good showing over there could set them up nicely for a first ever final appearance. ALGIERS (Reuters) - Algeria have suspended all football this weekend in memory of Albert Ebosse, the striker killed on Saturday after being struck by an object thrown from the crowd during a Ligue 1 match in the north African country. The Algerian Football Federation said in a statement it was considering several punitive measures including expelling Ebosse’s club JS Kabylie from all competitions. It did not specify a time period. The Cameroon forward was struck on the head by an object allegedly thrown from a section of his club's own fans as the players left the field at the end of a 2-1 defeat to USM Alger in Tizi Ouzou, a match in which he had scored his side's goal. JS Kabylie confirmed in a statement posted on the club's website that he had passed away in hospital later on Saturday, though they did not give the exact cause of death. The federation said the decision to cancel all matches this weekend was also to protest “the irresponsible action of fanatics and hooligans who perpetuate violence in stadiums which has reached unacceptable proportions”. The federation and JS Kabylie said an immediate sum of $100,000 had been given to Ebosse’s family and the remainder of his contract would also be paid out. The 24-year-old Ebosse was the leading scorer in the Algerian league in the 2013-14 season with 17 goals having played the previous season in Malaysia. The world players' union FIFPro said the incident was a reflection on the poor management of football in Africa. "In recent years, we have constantly had to denounce the flagrant lack of professionalism among African executives," said Stephane Burchkalter, general secretary of FIFPro's African division. "On the one hand, they demand more and more of the players, in terms of investment. In plain terms, players have to be beyond reproach. If they make the slightest mistake, they are criticised and penalised. "On the other hand, the executives are allowed to do as they wish, without the least professionalism. They can 'forget' to pay wages, or play with the lives of players by organising competitions without providing the most elementary safety precautions. "If drastic measures are not taken to preserve the safety of footballers, in Algeria as well as in a great number of other African countries, other incidents are unfortunately to be feared. "In terms of sport, Algeria showed what it was capable of during the last World Cup but that is not enough," he added, referring to Algeria's progress to the last 16 in Brazil. Group 8 is still mired in some confusion regarding the runners up. Apparently, Persewon didn't turn up for their final home game which was a bit daft! The last plan I heard was just two teams would be promoted to the ISL for next season from the play offs. Strong representation from Cetral Java and Yogyakarta; Persinga, Persis, PSIS, PSCS and PSS. And xome of them have the potential to pull big crowds! to bring their original photo ID for entry into Jalan Besar Stadium for the match if they have Local tickets. The FAS wishes to remind the public that Away fans holding Local tickets will not be allowed into the Stadium. The FAS also reserves the right to turn away fans without their original photo ID, and to move any JDT II fans found sitting among LionsXII supporters to areas designated for away support. We seek everyone’s patience and understanding and their support to help make this match a pleasant and enjoyable experience for all. COMMENT - I wonder what the outcry would be if English Premier League enforced such restrictions? Back in the Super League, Singapore kept travelling JDT fans at immigration for two hours before allowing them to travel to Jalan Besar...then wouldn't let them in. Aren't they lucky Indonesia were drawn in the group based in Vietnam for the ASEAN Cup? !